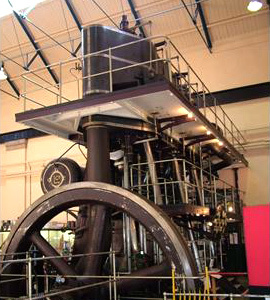 Steam traps from TLV Euro Engineering have been used in the refurbishment of a 300hp vertical triple-expansion reciprocating steam engine at the Museum of Power near Maldon, Essex. The steam engine — known as Marshall — dates back to the 1930s and was fitted with a refurbished 30-year-old steam boiler from Felixstowe Docks using equipment and services from TLV. The company supplied its cast stainless steel J3S-X free-float steam traps and brass-bodied LV13N balanced-pressure thermostatic steam traps. These steam traps can be installed on equipment that uses steam as a heat source; they provide continuous, smooth, low-velocity condensate discharge as loads vary. They have a single moving part — the Free Float® — preventing concentrated wear and therefore the requirement for maintenance. The steam traps are compact and feature large condensate discharge capacities. They are equipped with an X-element air vent to provide an automatic air-vent function. These steam traps feature a ‘fail-open’ design. They are operated by the temperature difference between steam and condensate. They incorporate a multi-diaphragm construction for long service life.